VISConti meets professionals from industry and Higher Education. This was the second of three Multiplier Events that VISConti organised during the funded lifetime of the project and it was organised and hosted by partner in VISConti project CEEI Burgos. 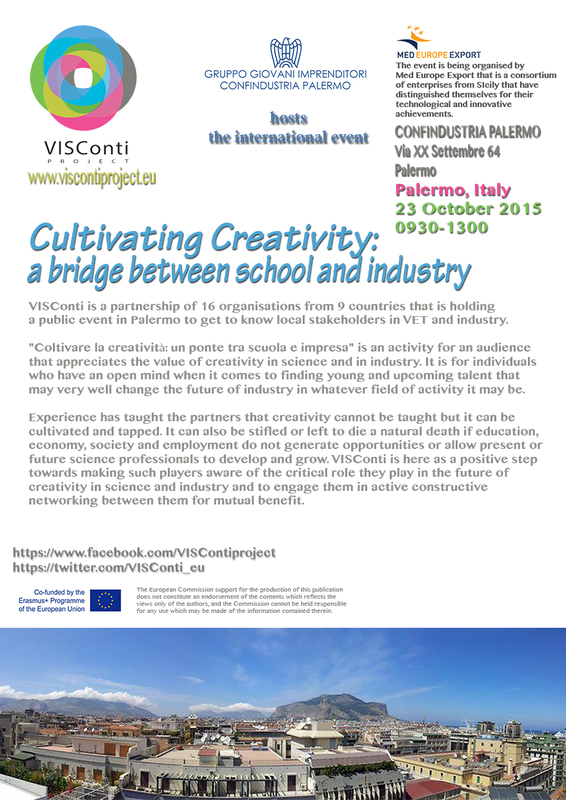 VISConti meets industry and schools in Palermo. The event was hosted and organised by a VISConti partner Med Export Europe. This is the first of three Multiplier Events that VISConti organised in the funded period of the project to bring VISConti partners in contact with industry and to raise awareness and interest of professionals in VET and in industry about VISConti and its mission. It was also a reaching out exercise to engage participants into the networking activities of the project that were to mature into a Community of Practice in the following months. There were participants from the partner organisations in the VISConti project, members of the public as well as VET students from two schools. The Multiplier Event was addressed by leading members of Confindustria Palermo, Med Export Europe and Young Entrepreneurs. Talks were about incentive, mobility, opportunities for expression of creativity in science and technology. This workshop was organised and hosted by VisMedNet Association of Malta and it was attended by almost all the partners of the VISConti project each one with several participants. The objective of the workshop was to set the philosophy of VISConti on Creativity in the minds of the partners. Sessions were about assessment and possible methods of measuring creativity, mindset and seeking alternative ways. The participants also got exposure to Eco Domus project in Sicily that has created the first prototype of a zero carbon footprint house.